Not all superheroes wear capes. Some of us wear cocktail dresses and high heels. That’s who we are. Timewise has been around for 19 years – yes, that’s a long time. With those years comes a lot of lessons learned and that’s one of the things that puts us at the front of the pack. But that doesn’t mean we’re old and stodgy! We thrive on innovation and new trends, whether it’s the latest and greatest in event mobile apps, the hottest clubs, the best lattes, or the coolest patios. If you’re looking for something, we can probably tell you who has it or where to find it. That’s just what we do. Arlene Schilke and Brent Taylor lead an incredibly creative driven young team of #eventprofs. They’ve been called into Boardrooms countless times by Agencies, Associations and Corporations who were in over their heads. And save the day? That’s just what we do. Of course, having the most cost-effective audio-visual company (Event Technology Solutions) helps. Are you still creeping on us through social media? Pick up the phone and call us – let’s meet and you can see what we’re really about. That’s just what we do. Interested in joining our vibrant team? We are looking to fill a one year maternity leave position for an Event Manager to work on Go West 2019 and Calgary/Edmonton Event Awards, with the opportunity to lead to a long-term contract in our company. Timewise Event Management is a proud producer of GO WEST Canada. GO WEST is an annual event that focuses on education, innovation and networking for event professionals. Arlene is the founder of TImewise and a partner with Event Technology Solutions. She is a true industry ambassador and mentor to many rising stars. Arlene is a president of MPI Edmonton Chapter. She was named one of the top event professionals to follow on Snapchat by Canadian Special Events Magazine (follow her to get a glance of her #eventprofs life) and is very active on social media. She is a successful entrepreneur nominated for Celebration of Achievement Award by Alberta Women Entrepreneurs. She is a mom of 4 energetic and creative kids, always on the run with her Fitbit, managing her business, household and a husband! She is a Certified Meeting Professional (CMP) and a big foodie always searching for the new #yeg restaurants, cafés and bars. Brent is a partner with Timewise and the founder of our audio visual division, Event Technology Solutions. Brent may have done very well in-front of the camera, but he was too fascinated with the magic behind it so he decided to gear up and bring #eventprofs a company that focuses on delivering stress-free AV services. He has 25 years experience as an audio visual technician, professional cameraman and producer. Brent has his CMP and CMM and was recently as Event Professional of the Year by the 2018 Canadian Event Industry Awards. He is a member of several advisory boards and just began a 3-year term on MPI's International Board of Directors. He is a Coca-Cola addict (although he may not admit it) and loves connecting with people. Nela is originally from a small country in the heart of Europe called Slovakia. She always loved to organize (mostly for others) and plan events. Her strengths are woo (our clients totally love her), communication and activation. In her free time, you can find her at Hot Mamas fitness classes with her two beautiful daughters or baking healthy treats (#nosugar!). She is a coffee lover and recently did her first 10K race! She is VP of Education for the ILEA Edmonton Chapter and an ILEA Esprit Award recipient. But don't be fooled by her pretty face, she also has a Master's Degree in Production Management and her CMP designation. Although she has been with us for three years, Laura is the newest member of the Timewise team. She joins us from Germany after studying Events Management in England, but her heart brought her to Edmonton. She is an early bird, her task list is half finished before the rest of the team even arrive at the office. She loves the mountains - especially hiking and skiing (good thing she chose Alberta for living!). Her strengths are achiever and learner (she just got her Certified Meeting Professional (CMP) designation). Laura takes great satisfaction from being busy and productive. She is a vegetarian and passionate about a healthy non-toxic life style! Sam is originally from Calgary, joining us for her internship year. She has a Hospitality Management Diploma from SAIT Polytechnic and is currently in her third year studying in England at the University of Gloucestershire for her Bachelor of Arts (Hons) in Event Management. Her strengths are that she is very well organized, hardworking and goal oriented. She loves to travel and has been to 14 countries. She has a major sweet tooth! She enjoys being productive and cares about doing a good job for clients and her employer. What can we do for you? It's quite fun to do the impossible, so let's have fun reaching for perfection with our team! We offer premium consulting services for your event. We are passionate about our industry, and it is this passion that drives our desire for excellence. We have developed a large corporate body of knowledge that enhances our competencies and expertise. The attendee experience is one of the most important elements of your event. We put ourselves in the shoes of your delegates to develop practical access plans, thorough transport and accommodation plans, detailed event timelines and production schedules, and superior on-site service – creating a seamless delegate journey. We design and transform spaces using state-of-the-art lighting and AV equipment, special effects, props and bespoke art installations. 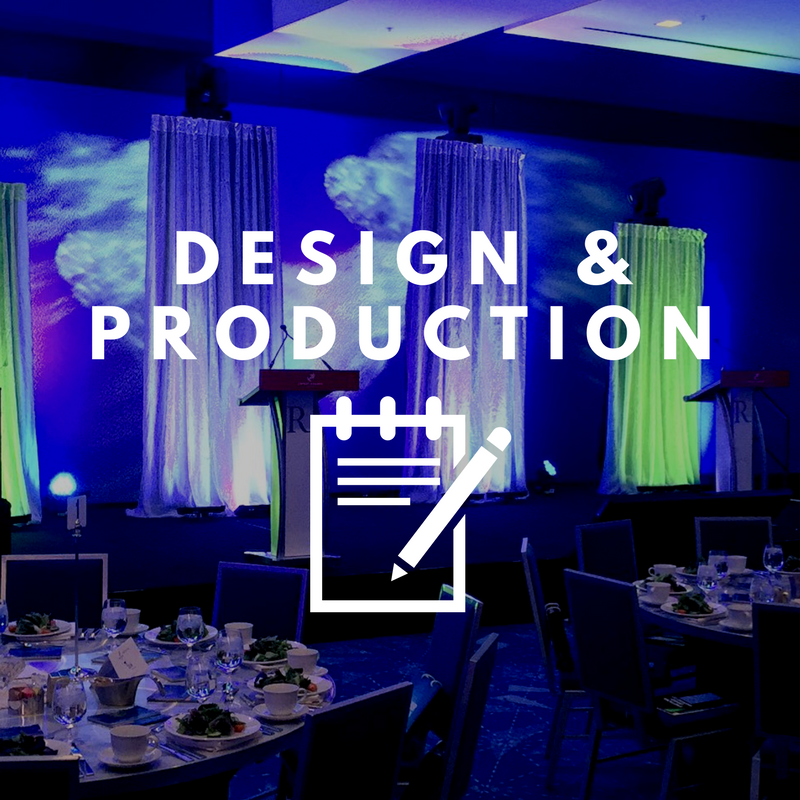 We will work with you on your event design and production from the first design idea to ensuring everything runs effortless on-site. We offer creative & innovative event solutions. We operate as a one stop shop including an in-house AV division, a promotional products distribution and beyond. Anything you need - we have a "make it happen" attitude! We design and implement engaging communication and marketing strategies that generate excitement and anticipation from the first save-the-date, through to the post event cascade and beyond. Our team brings to your event an extensive knowledge of audio visual services and event technology. We are unique in that we have an audiovisual division (Event Technology Solutions). Having access to in-house technicians and equipment rentals will ensure seamless technical services for this project and allows us greater flexibility in audiovisual pricing. The largest media company covering the meeting and event industry is onboard for GO WEST 2019. Timewise Event Management, producer of GO WEST, has announced the signing of a formal agreement with BizBash. This agreement will form a high-level partnership to expand the reach of GO WEST 2019 across Canada and into the USA. Timewise Event Management’s managing partner Brent Taylor was bestowed with Canada's highest honour at the 2018 Annual Canadian Event Industry Awards hosted in Toronto on March 21, 2018.